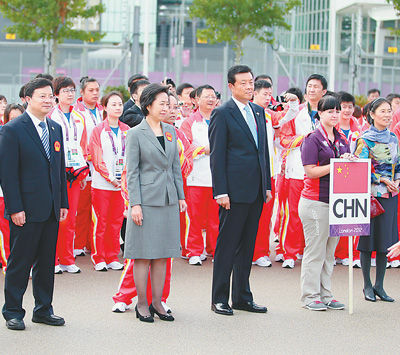 LONDON August 24(People's Daily, by Li Wenyun)- At 9:30 a.m. London time, August 24, the Chinese sports delegation to the 14th Paralympic Games held the flag-raising ceremony at the Paralympic Village in London. Over 200 members of the Chinese delegation attended the ceremony. As the Chinese national anthem is played, the five-star red flag is once again flying over the Olympic Village in London. The Chinese disabled athletes greeted the upcoming grand event of the Paralympic Games in high spirit with the great ambition to live up to the expectations of the Chinese people. Eva Loeffler, Mayor of London Paralympic village, welcomed the Chinese sports delegation on behalf of the London Olympic Organizing Committee at the flag-raising ceremony. She said in her speech that during the 1948 London Olympics, some disabled veterans organized and attended some demonstration events. This marked the birth of the Paralympic Games. Now after more than 60 years, the Paralympics returns to its "homeland". In the Paralympic Games the most important is not the gold medal but the spirit shown by every disabled athlete. Every competitor in the Paralympics is a true champion. Madame Wang Naikun, Deputy Head of the Chinese sports delegation and Vice-Chairperson of China Disabled Persons' Federation, exchanged gifts with Mayor Loeffler and left her autograph on the memorial wall. A wonderful British style performance was presented throughout the flag-raising ceremony. The beautiful singing and warm performance pushed the atmosphere on scene to the peak. Chinese Ambassador Liu Xiaoming attended the flag-raising ceremony and visited the disabled athletes of the Chinese sports delegation in the Paralympic Village. He encouraged the athletes to continue their strengths, fight hard and win a new glory. He hoped that all the athletes would display the spirit of the Chinese disabled persons with great performance, demonstrate the great achievements of the undertakings for disabled persons in China and present the excellent traditions of the Chinese national as well as China's image as a great country of civilization.